I run because it’s my passion, and not just a sport. Every time I walk out the door, I know why I’m going where I’m going and I’m already focused on that special place where I find my peace and solitude. Running, to me, is more than just a physical exercise… it’s a consistent reward for victory! 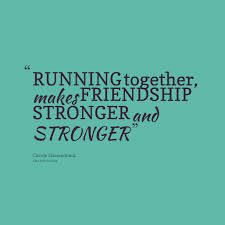 The reason we race isn’t so much to beat each other… but to be with each other. Believe that you can run farther or faster. Believe that you’re young enough, old enough, strong enough, and so on to accomplish everything you want to do. Don’t let worn-out beliefs stop you from moving beyond yourself. I’ve officially hit the wall. And it isn’t pretty. It’s not the age Honey, it’s the mileage. Stolen from Indiana Jones in Raiders of the Lost Ark.